Sixteen year old Katniss Everdeen is living in a dystopian future in the poorest of twelve districts. Each year, two young adults between the ages of 12-18 are chosen from each district to compete in a gladiator style fight to the death called The Hunger Games. The event is televised and all members of the districts are forced to watch as a reminder of the power of their rulers at the Capitol. When Katniss’ little sister is chosen as a contestant, Katniss volunteers herself in her sister’s place. She is whisked away to the Capitol with her male counterpart, Peeta, to begin training for the event. Despite her bristly nature, she makes some unlikely alliances who find ways to help her survive the arena. Katniss has unique survival skill sets that quickly make her a target of the other, more brutal competitors. Katniss soon discovers that more than just her life is at stake in these games, and she must employ all of her wits and prowess to come out of the arena a victor. Admittedly, I could not put this book down. I stayed up long nights reading it, and at the conclusion I was already grabbing for the next book in the trilogy. Collins is an exceptional story writer who addresses important themes such as class, race, and exhibitionism throughout her novel. The concept of kids killing kids in a televised event is horrific, but Collins manages to infuse just the right amount violence without detracting from the story. None of the violence depicted is glorified or gratuitous. Each act of violence seems to propel the story forward and capture an underlying meaning. Katniss is a reluctant heroine. It is clear that she is a teen who is simply thrown into unfortunate circumstances. Her ability to survive comes from years of avoiding starvation and living in extreme poverty. Her character arc is compelling, as she eventually finds herself wrapped up in a series events beyond her control. She accepts her various roles warily and her adaptability as a character is incredible. Reader’s Annotation: Survival of the fittest has taken on a whole new meaning. Twenty four teens will enter the arena, but only one can survive. “Bestselling author Suzanne Collins first made her mark in children’s literature with the New York Times bestselling Underland Chronicles series for middle grade readers. 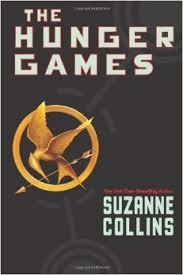 Her debut for readers aged 12 and up, The Hunger Games (September 2008), immediately became a New York Times bestseller, appealing to both teen readers and adults. Suzanne Collins has also had a successful and prolific career writing for children’s television. She has worked on the staffs of several Nickelodeon shows, including the Emmy-nominated hit Clarissa Explains It All and The Mystery Files of Shelby Woo. She received a Writers Guild of America nomination in animation for co-writing the critically acclaimed Christmas special, Santa, Baby! Describe the premise of The Hunger Games event. Talk about Katniss volunteering in place of her younger sister. Justification of Selection: This book is a long running best seller for teen readers. It is a must have for a teen collection.